In the digital world we have it pretty easy, when it comes to recalling settings. Nearly every plug-in on the planet has the ability to save settings and templates are also save-able in most DAW's. Yet, even with these powerful tools we will not take full advantage of their potential in our Home Studios. 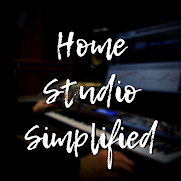 One thing we as Home Studio hobbyists struggle the most with is time. Finding time to record, finding time to mix, finding time to find the time to do so. Well, when you have a good set of presets and a healthy array of templates, you can essentially win back some of that time. How creative is it to label tracks, then color code them, then place icons next to them to further identify, on and on the viscous cycle goes? However, if you predominantly record just yourself singing and playing the guitar, make a template from your last session! If you find you always reach for the same plug-ins come mixing time, put them in that template with good starting point settings. Then, every time that creativity starts to flow the, its not held back by the dam of technicality. While it is a fact that some things simply can't be saved, there is another way around this as well. For instance, in the video included below, I painstakingly worked with my DAW to get buffer settings that would not interfere with my screen recorder, It took quite a bit of my precious time! Well, once I got those settings dialed in, and knowing that I would have to change them later, I took a screenshot of the settings. Then after labeling the pic accordingly I can now go back to those settings anytime now! This can be done with anything on your screen! So if you got that Bass EQ sounding good and want to send that to a friend, make a screenshot of your page and send it to them. Or maybe, you got an error you're not sure of in your DAW, screenshots can help show the support team from that company exactly what you're going through. Every keyboard has this feature, you may have to search for it if you're not aware of it. Simply press the “Print Screen” button and open up your paint program or even a Word document and paste into it. Either CTRL+V or right clicking on the mouse and selecting paste will get you there.